For more information, go to Louisbourg Lighthouse Society . This is the third lighthouse built at Louisbourg. It was completed in 1923, a year after the second light burned. It is a white concrete octagonal tower, 55 feet high. Several modifications have been made to the characteristic of the light over time. 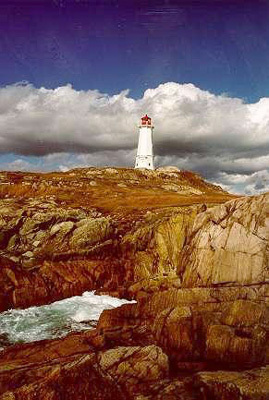 Sources: Against Darkenss and Storm, Harry Thurston; Lighthouses of Nova Scotia, David E. Stephens; Historic Sites and Monuments Board Plaques. 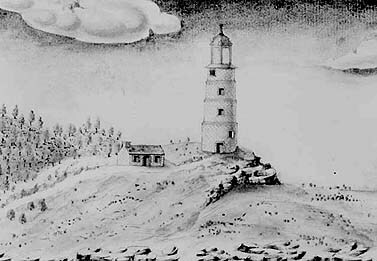 A depiction by an English engraver who had never seen either Louisbourg or the lighthouse, likely taken from a sketch made by a military artist. The lighthouse constructed by the French at Louisbourg was the first established in Canada, and the second on the North American continent. (The first North American light was lit on September 14, 1716 on Little Brewster Island in Boston Harbour.) 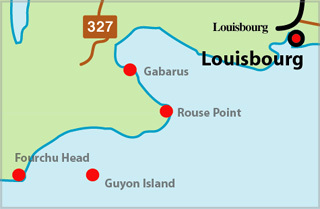 Louisbourg, built near the northeast corner of Cape Breton Island, was the base from which the French planned to hold New France against the English. The Fortress was dependant upon ships from France to supply most of its needs. Safe entrance to the harbour at the end of the long voyage became a concern. 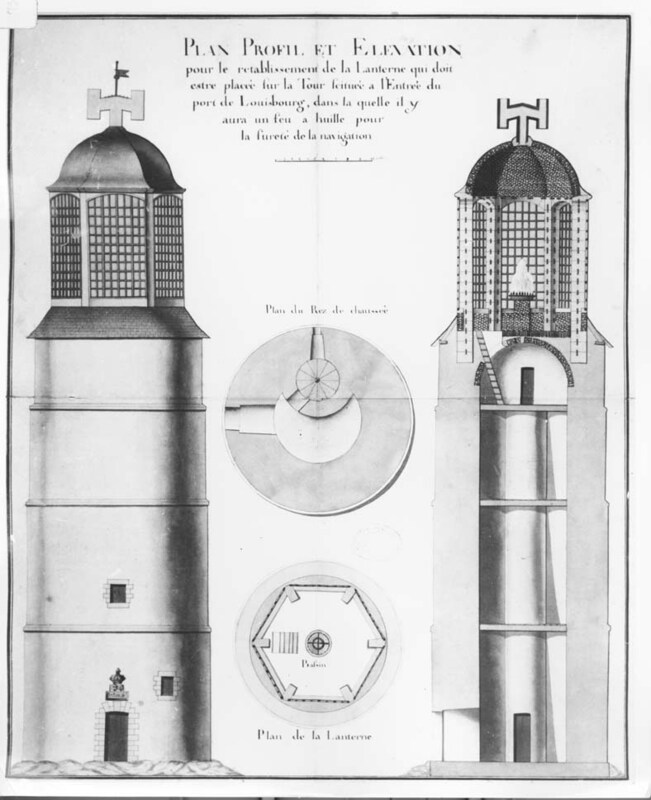 The initial plan to build a tower and light was made in late 1727, though the formal decision to build was not made until spring of 1729, after one of the King's ships, Le Profond nearly met its end in the harbour which was marked only by a navigational cross, and periodically by a bonfire. Construction began in August of 1731. The c. 70 foot circular tower made of coursed rubble was completed two years later. The first lighting of the sperm oil lantern was not made until the first of April, 1734. This was due to a delay in the arrival of some 400 small lantern panes from France - the first ones sent were the wrong size and new ones could not be shipped until the next spring. The actual light was a circle of cod-liver oil fed wicks set in a copper ring mounted on cork floats. This light was said to be visible for 18 nautical miles, an impressive distance for those times. A small duty was levied on vessels using Louisbourg Harbour to cover the expense of construction and upkeep - including the lightkeepers salary. This was a profitable light, since the duty covered the cost of building it, and more. Built by the French in 1730. As in all these early open-flame lights, much heat was generated inside the lantern. The lantern design proved faulty, for the wood had no protection from the high temperatures, resulting in the gutting of the lantern by fire, during the night of September 11, 1736. The stone tower survived, and a light on top of it, burning coal and wood, was quickly re-established. Also, during the two years of reconstruction, beacons were lit along the coast. The reconstructed lantern was designed to prevent a similar occurrence. The project engineer installed a larger fuel basin, placed in a water jacket to dissipate the heat, and with wicks spaced further apart so that the heat generated would be less intense. There was no wood in the lantern. It was designed with six stone pillars surmounted by a vault-shaped brick roof covered with lead, with vents fitted into each of the 6 faces, and a chimney. The window frames were of iron. 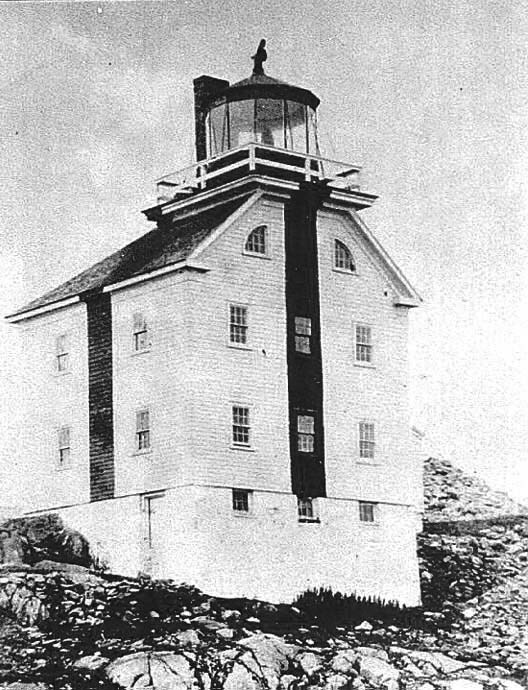 The "new" light was completed in July, 1738. Reflectors were added in 1751 to focus the light from the thirty-two lamp wicks. This light functioned for twenty years. 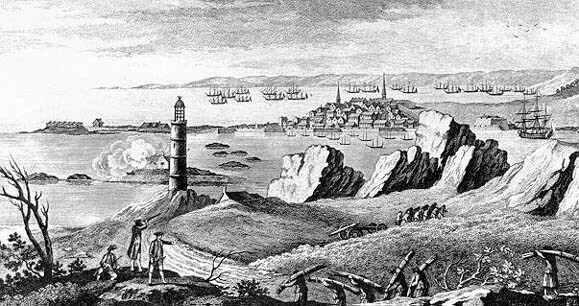 During the second British seige of Louisbourg, the tower was heavily damaged, particularly so on the evening of June 9, 1758, when British batteries and naval vessels opened a heavy bombardment on Louisbourg. The light was deemed beyond repair and left to disintegrate. During the 19th century, maritime officials took steps to reduce the many navigational risks and ship wrecks along the Atlantic coast. One of the new lighthouses built was the second for Louisbourg, completed in 1842. It was a 2 1/2 storey wooden building that also served as a residence for the keeper. Painted white, it had black vertical stripes. The structure was erected on a massive cut-stone foundation that lay upon the bedrock. There was a full basement in which archaeologists found a wrought iron tank that was identified as being manufactured for the British Navy for holding water or oil. Fire destroyed this building in 1922. The lighthouse is located on a point of land across the harbour from the Fortress of Louisbourg, about 30 km from Sydney, Cape Breton. The first keeper at Louisbourg Lighthouse was Jean Guinard dit Belair (1674 – 1744). He was born at Poitiers and joined the Marine Service (Navy). He was sent to Placentia, Newfoundland, to help protect the fishery. In 1713, the French left Newfoundland and went to Cape Breton. Jean went to Louisbourg and in 1726 he retired from the Marine Service to do carpentry full-time. Jean was working class and could neither read nor write. He married twice and had two children from his first marriage and four from the second. He kept four goats and a ram to help feed his family, and he had his own canoe. As keeper of the Louisbourg Lighthouse he was paid 350 livre ($7000.00) per year. His son Nicholas helped. He kept lighthouse until he died at age 70, from 1734 - 1744.